A group of 14 Global Leaders Programme (GLP) Members travelled to northern Spain to develop their global outlook. In partnership with Universidad De Burgos, GLP have developed a seven day programme exploring industry, cultural heritage and the engines of the economy in Spain. CU students and staff received a warm welcome from Universidad De Burgos, Vice Chancellor for Internationalisation, Mrs. Elena Vicente. 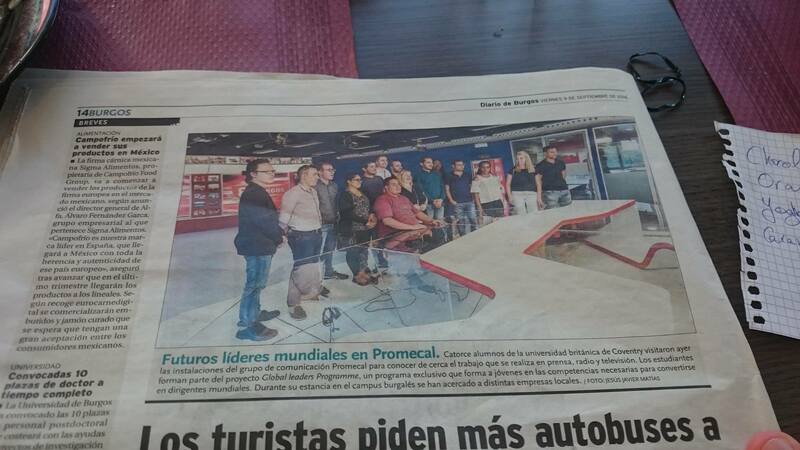 The members have had the fantastic opportunity to visit companies such as Santander, Promecal – Communication Group, L’Oreal and meet with high profile leaders such as the General Director of Grupo Antolin, Testing and Experimentation Director at Regulatory Council of Ribera del Duero. This trip marks the 3rd trip in the development of our relationship. 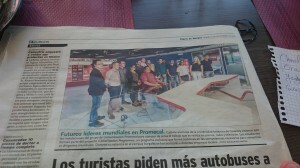 GLP students in the local Paper in Burgos visiting Promecal, communication group specialising in regional information and multimedia services.